Plane wreckage from the stolen Q400 burns on Ketron Island, Washington. A 29-year-old airline employee “thought to be suicidal” stole a 76-seat Q400 turboprop plane from Seattle-Tacoma International Airport (Sea-Tac) on Friday night, eventually crashing some 30 miles away with fighter jets on his tail, the New York Times reported. Local authorities confirmed he is dead. “Nah, I mean, I don’t need that much help. I’ve played some video games before,” the man responds. 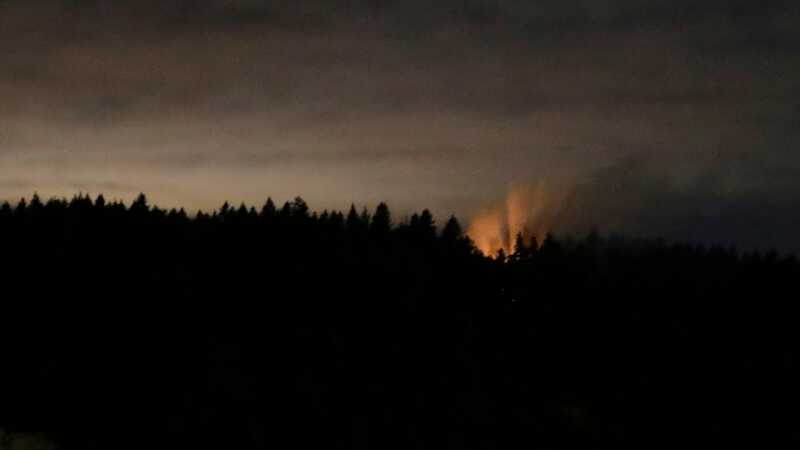 Eventually the plane crashed on Ketron Island on Puget Sound in Pierce County, setting it ablaze, after two F-15 jets with the Oregon Air National Guard’s 142nd Fighter Wing were scrambled to intercept it. It’s not totally clear whether the pilot was aware of the jets closing in before he crashed, though video posted to Twitter shows them flying close enough to the Q400 that he should have been aware of their presence. According to CNN, North American Aerospace Defense Command (NORAD) said the jets were armed but denied they fired upon the aircraft. The rogue employee is believed to be a ground service agent, a role which entails baggage and cargo handling in addition to directing and de-icing aircraft, for Horizon Air, the Times added. The Embry-Riddle Aeronautical University’s College of Aviation dean Alan J. Stolzer told the paper that while the man would have needed Transportation Security Administration clearance to gain entrance to the aircraft, once inside the flight deck there are typically no security measures such as “an ignition switch with a key” to prevent someone from taking control. CNN safety analyst David Soucie said, “There is a protocol to not allow anyone singularly to get onboard an aircraft… Every airport in the country is going to be looking” at whether that needs to be updated. Mary Schiavo, an aviation analyst with CNN, added that the pilot seemed to know some basic elements of flying such as firing both engines in tandem and using the yoke and rudders at the same time to coordinate turns. But she said he also apparently lacked basic knowledge of cockpit elements such as how to set a heading manually. The incident caused hours of delays at Sea-Tac.